If you’re hungry for some R&B classics, you will definitely be well fed at the Buffet Tour. 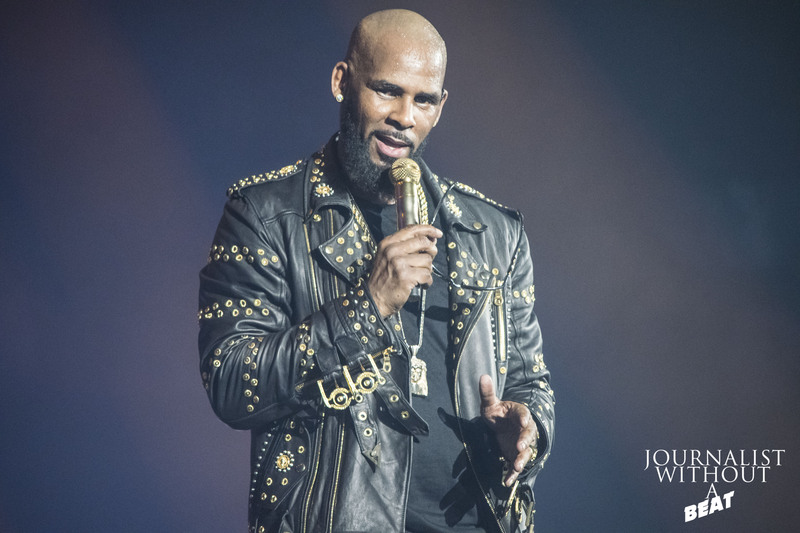 Well-dressed fans took to the sold-out Allstate Arena to see the Pied Piper of R&B himself as R. Kelly brought the Buffet Tour to Chicago. It should be noted that this isn’t just your standard concert; it’s a cinematic experience with live theater elements. R. Kelly didn’t hold back when it came to production. Showtime came around 9:15 as the lights in the Allstate Arena went dark and as the sounds of an orchestra began to play. On the main stage, the background displayed a mansion on a dark raining night. Suddenly, something large, shaped like an human fell from the ceiling, crashing with a loud thud. The hot Chicago crowd all assumed the King of R&B had fallen from the top of the arena. They groaned in horror, hoping it wasn’t true. The true showman that he is, R. Kelly emerged from the floor sporting his look from his 12 Play days, reincarnated as a black dove. He came forward as his assistant brought out his jewelry box. Kells put on his rings and chain and proceeded to kick things off with a melody of bangers that included Make It Rain, My Story, and Go Getta. The crowd was in R. Kelly’s palm from the get-go. At times, the crowd would outweigh Kelly’s vocals with their own voices. Kelly would just point the mic in direction of the crowd as they belted out every lyric, word for word. This was evident with his performance of When A Woman’s Fed Up. Small intermissions would come in different forms of entertainment. There was a music guessing game that pitted the right and left side of the arena against each other. Video packages were also shown. There was one called “Just Jokes TV”, this was a video of R Kelly eating chili and chips talking to the audience. R. Kelly also had a blimp/robot/drone named R. Bot that would fly around the arena taking video of the live crowd that was displayed on the screens. The most entertaining intermission came when R. Kelly asked the audience did they see Kobe Bryant’s last game. He states that he posted a pic on social media congratulating Kobe on his career. In a process, a person online cracked a joke on Kelly’s t.v. size (which was shown in the background). Kells then asks for his assistants to bring out his chair, a recliner. He sat in this chair, with his back to the crowd, using the main stage screen as a television. He watched highlights from Kobe’s game, flipped through channels, and watched about 3 minutes of the film Life on Netflix. The show continued with R. Kelly having 5 wardrobe changes. He had one jacket displaying “Never Lose Passion To Go Platinum” and another one with the numbers “69”. The Pied Piper would go through almost his entire discography (including B-Sides). He truly hasn’t missed a step. His vocals were very strong, especially on Your Body’s Callin’. If there’s one thing to know about R. Kelly, it’s his great stage presence. He truly knows how to cater to a crowd, especially the ladies. He would ask the women in attendance, “who wants to go home with me?” which was met with a huge ovation. Kelly continued to flirt with the women of Chicago, asking one woman to wipe his nose, lips, and beard. She happily obliged. Speaking of beards, R. Kelly states he’s isn’t just a regular beard, rather it’s also a “gadget”. I’ll let you figure out what that means, true R Kelly fans know exactly what he meant by “gadget”. Taking the stage on the other side of the arena, Kells spoke genuinely to Chicago about how he appreciates and loves them for sticking with him for 28 years. He dedicated a cover of Sam Cooke’s A Change Is Gonna Come. The show came to an end with an exuberant performance of Happy People and Step In The Name Of Love . Chicago is known as the capital for stepping, so it was no surprise when couples and people who didn’t know each other began to dance in the rows and aisles. R. Kelly changed one last time, this time sporting a robe. He thanked Chicago for a wonderful time and wished everyone a good night. The audience couldn’t believe the show was over. The confirmation came It when the house lights of the arena turned on. Chicago was treated to the step in the name of love track playing as they exited. When it comes to a buffet, it’s known to have a spread of everything to sample. The Buffet Tour is a buffet of R&B greatness. What you are getting is a 2 hour plus show with full servings of every hit that R. Kelly has ever had spanning his 28 year career.